It’s something we don’t really think about — until it stops working. When your shower gets cold, that’s when things heat up! Amidst cries of outrage about cold water showers and cold water dish washing, we scramble to figure out what caused the water heater to stop working. But, before we talk about things that can go wrong with water heaters, let’s take a look at their simple, yet creative design and discover how it is they do what they do to make our daily lives more comfortable. The majority of residential water heaters are storage water heaters. They are basically tall cylindrical tanks–sort of like a tall metal drum. They vary in capacity from about 20 gallons to about 80 gallons of water. Even though traditional water heaters don’t present a very dramatic appearance, the principles they use to supply abundant hot water to your home are pretty interesting. Tank: The tank is made of heavy metal and is actually the inner component of the cylinder. It serves as a shell to hold the water. Tanks are often covered with some type of insulating material, a decorative “outer shell” and sometimes an additional insulating blanket-type cover. Dip Tube/Cold Water Inlet: Cold water enters the tank at the top and flows through this tube to the bottom of the tank. Because the water is cold, it stays close to the bottom of the tank where heating occurs. Hot Water Outlet: This pipe is also at the top of the tank. Heated water at the top of the tank exits through this outlet and flows to areas where it is needed. Shut-Off Valve: This valves closes off the flow of cold water into the tank. Drain Valve: This valve is near the bottom of the tank and is used to empty the tank when servicing is needed. Pressure Relief Valve: This valve serves to regulate pressure inside the tank. Anode Rod: This rod, made of steel overlaid with either magnesium or aluminum, is suspended in the water of the tank to help reduce corrosion. Heating mechanism: In a gas storage water heater, the heating mechanism is a gas burner and chimney system. An electrical storage water heater uses heating elements projecting into the interior of the tank to heat the water. Thermostat: This device is a thermometer and a temperature-control device. Electric water heaters may have individual thermostats for each heating element. Storage water heaters rely primarily on the scientific principle that hot water rises. Cold water enters the top of the tank through the dip tube or cold water inlet, flows through the pipe to the bottom of the tank where it exits the pipe, pushing the warmer water already in the tank upward. The thermostat setting is usually between 120 – 180 degrees Fahrenheit. The thermostat should be set nearer the lower end of this range in homes with small children to prevent potential scalding injuries. As the thermostat monitors the temperature of the water inside the tank, it regulates the function of the elements (on an electrical water heater) or the gas burner (on a gas water heater) to heat the water accordingly. Because heat rises, the hottest water is always closest to the top of the tank. When a hot water tap is turned on somewhere inside the home, the hot water exits the tank through the hot water outlet at the top of the tank and flows to the open tap. 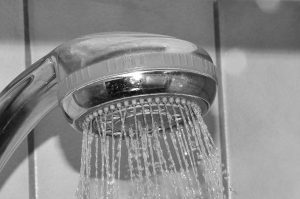 Now that we have a basic understanding of the parts of a water heater and how it works, our next post will take a look at some things that typically cause water heater problems resulting in the dreaded cold shower. Whether you have a malfunctioning water heater or a leaking faucet or a clogged drain, Knoxville Plumbing is here for you! The post Water Heaters 101 appeared first on Knoxville Plumbing | Plumber in Knoxville | Plumbing | Tennessee. You will be glad you came across Knoxville Plumbing! Because the Person we want to see happy with our Knoxville Plumbing service is You.